Whether you were travelling in parts of Europe, Africa, the Far East, Mexico or the Caribbean you could have experienced illness whilst on your holiday. Our Personal Injury Holiday Specialists are the UK's leading team, and assist hundreds of clients every year, to claim compensation for food poisoning contracted abroad. When a holiday is ruined or spoilt by an illness that could have been prevented it is inexcusable. If you travelled on a package holiday, you have the reassurance that you are protected by the powerful Package Travel Regulations 1992, should things go wrong. These Regulations make your tour operator liable to pay compensation if you or a member of your family were ill and suffered food poisoning because your hotel failed to take reasonable care. The law allows you 3 years to start a holiday claim in our courts for compensation and in the case of children - 3 years from the date the child reaches 18 years of age. Have you suffered food poisoning on a package holiday? Ill holidaymakers will often accept their predicament, conceding they are unable to prove that the illness was caused by failings in food safety regimes at hotels. Some accept it as inevitable and include within their luggage Imodium and other medicines used to treat traveller’s diarrhoea. However, holidaymakers on package holidays with UK tour operators can claim compensation if their holiday was ruined by food poisoning and poor hygiene practices. Our travel lawyers believe that the vast majority of illnesses experienced by holidaymakers are infective, and it is entirely feasible that with specialist help a successful claim can be made. Many tour operators will say the so-called diarrhoea or 'gippy tummy' was caused by change in food, over eating, over drinking, heat, rapid change of temperature, iced drinks and so on. Unfortunately, the ability of the lay person to challenge a tour operator's findings following their complaint can sometimes be limited. If you recently returned from abroad and have been diagnosed with a bacterial infection from either Salmonella, Campylobacter, E. Coli, Shigella or Cryptosporidium, please contact us We would be interested to know when you travelled and the name of the hotel you visited. We are holiday law specialists, many of us having worked in the legal departments of some the UK's largest tour operators including: Thomas Cook; First Choice; and Thomson Holidays. We work closely with experts in gastroenterology, microbiology and food hygiene safety, ensuring that our clients' cases receive the highest level of support that is expected from a national law firm, with the reputation that Simpson Millar LLP has established over 150 years. 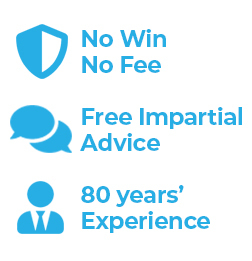 We can advise you on whether we believe you have a good case and how much compensation you could be entitled to receive. Our services are provided on a no win no fee basis, meaning you have nothing to lose, but possibly much to gain especially if you suffered from food poisoning or gastric illness abroad. Our Holiday Illness Claims Experts can claim compensation for you, no matter where you live in the UK.